If you haven’t kept tabs on Wye Oak since 2011’s Civilian…umm, surprise. Shriek features Jenn Wasner moving away electric guitar to bass, and unsung drummer Andy Stack stepping up to the plate. Shriek works off of an electronic palate, losing the grinding feedback that was a hallmark of the band. Much will be made of this transition, but the timing is perfect, as the band is fully entrenched in their identity, and the whole point is that Wye Oak is whatever they want it to be. If you kept tabs with Wasner’s side projects Flock Of Dimes or the dance party that is Dungeonesse, or caught their last tour where they opened with the motorik “Spiral,” you knew how it was coming down. And Shriek delivers, with opener “Before” working towards a very literal definition of dream pop. The middle trifecta “Glory,” “Sick Talk,” and “Schools Of Eyes” is the heart of darkness of the album, and as expansive and well-drawn the episodes are, the ultimate payoff is the soaring closer “Logic Of Color,” the gift that keeps on giving. 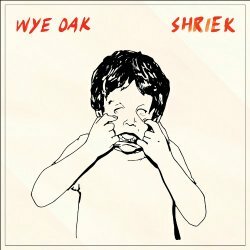 While we miss our guitar hero, Wye Oak has shredded their own rule book on Shriek while maintaining their oneness, proving that the journey is the destination.